Two days make quite a difference in Colorado. Just this past Monday I was fishing during a heavy snowstorm. Aside from the stream not being frozen over, it could have been the middle of winter even though in reality it is now late April. 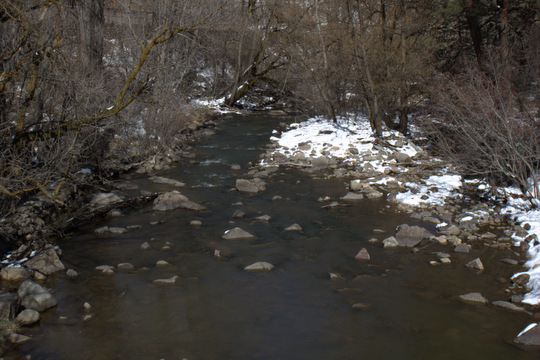 On Wednesday, the last of the snow was melting along Boulder Creek. I took a picture of the same pool I fished and photographed on Monday. It looks just a little bit different. Maybe its just wishful thinking, but I'm guessing that we have seen the last of the snow. Every time I think spring has arrived, winter laughs in my face so time will only tell if we have finally turned the corner. There is a lot (finally!) of snow in the high country ready to melt and head down the hill so my fishing my start trending towards warm water options in the near future. I'm starting to consider an early summer trip to chase the salmon fly hatch on the other side of the state as well. School will soon be out so things will be getting more enjoyable for me!!! Woohoo! 70 degrees tomorrow and I finally got my license. Howard, does that mean you will be fishing soon? I'll be looking forward to reading your report!